The advantages of custom shirts are obvious: one, they'll fit you great, and two, even the finest clothiers rarely carry ringer tees that say "Pace Academy Class of '97 Rules!". 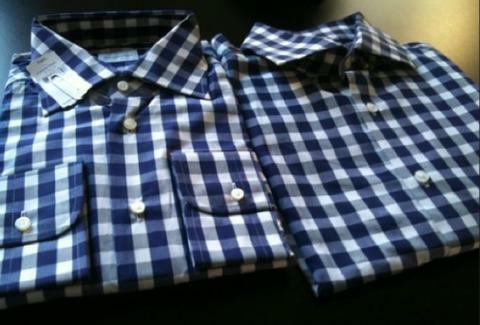 Making shirts almost better than that: J. Hilburn. Just now available in ATL, JH offers indubitably stylish, 100% made-to-order shirts, pants, and more, and was started by a couple Wall Street brokers, although it's amazing that job even exists, as most people already own that movie. Make an appointment to have their Style Advisor visit your home or workplace and measure you up, and jot down your choices once you've picked your collar, cuffs, and seam; once the details're sent off to their home base you'll get your shirt in about three weeks, complete with your initials or any three letters sewn into the collar, so definitely get "STD". You'll then peruse books of Italian fabrics ranging from compact cotton to 2-ply 100ct broadcloth, and assorted patterns/colors as diverse as purple/sky check, aubergine oxford, and berry pepper allover print, hopefully of his 61* Roger Maris character and not the Battlefield Earth guy. They're also crafting custom trousers, cufflinks, socks, and even belt buckles, and in a couple months they'll have denim and pima cotton t-shirts -- which, even though they don't trumpet tales of Powder Puff victories past, should help you keep Pace.